Individual serving packages. I used to buy those big jars of natural apple sauce, use a half-cup or so, put the rest in the fridge, and then a month later find green fur growing in the jar. After throwing away a few jars of barely-used apple sauce, I found myself reaching for the little snack-sized containers that my daughter takes for lunch. These come in 6-packs, and each holds 4 ounces, which is a little more than 1/3 cup and not quite 1/2 cup. 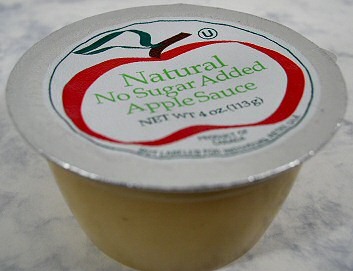 When you see me indicating 4 ounces of unsweetened apple sauce, that’s what I’m using. Now you know my trick. The birthday cake is now out of the oven, and the whole house smells like . . . . oops, can’t tell you the flavor. It’s a surprise, you know! Check back later tomorrow night for all the details, photos, and possibly even a recipe. I use applesauce in baking. I make some yummy oatmeal raisin cookies with applesauce for the oil. And I am in the process of experimenting with applesauce in cornbread! The first time I used equal amounts of applesauce to oil, and it came out very gooey. Tasted fine, but didn't like the texture. Second time I used half the amount of applesauce to oil ratio. And it turned out much better! I may try again with a third of the amount and see what happens! I made banana ‘cake’ (or ‘bread’ – as a ‘virgin’ baker, I don’t know the difference) – yesterday using applesauce instead of oil. Since I didn’t add sugar either, the fruit was solely responsible for any sweetness. It’s didn’t come out too bad, considering my embarrassing track record of charring anything inside an oven. I was especially delighted when my picky hubby appreciated the dessert! I plan to make an apple-nut muffin next. It appears that thee baking-bug has bit me! Try apple butter instead of apple sauce-it makes whatever you are baking a little bit darker but the flavor is great as it is a ‘concentrated’ apple sauce. Look for the unsweetened kind in a natural food store as supermarket apple butter usually contains corn syrup and or other sweeteners and fillers. It is more expensive but worth it! I put it in vegan chocolate chocolate chip cookies for up to all the oil called for in the recipe or any part of it. I have also used it in vegan corn bread. That sounds perfect for baking sweets! We already love “toast” sprouted bread with apple butter as a treat, we often enjoy it as a snack or dessert! I never thought of baking with it! I love to use pureed prunes for a smoother texture. Just soak dried prunes in hot water, and puree them slightly with a hand blender with a few tablespoons of hot water. I use it in cookies and it comes out great every time! Yogurt and canned pumpkin work pretty well too. Obviously you have to be careful with pumpkin though because of the flavor. If you’re substituting a non-acidic ingredient (oil) with an acidic one (applesauce), you should swap a little baking powder with baking soda. This might be why some of your recipes aren’t coming out right. Great tip and trick. Thanks! what is the exact substitute for applesauce to oil? can anything be substituted for butter? I LOVE carrot cake, please tell me you have a fat free recipe for me. I used to do the same thing and found this little trick works so much better! I’ve been using pumpkin puree as well for my fall baking needs! 🙂 Sooo good! I have a baking book which uses Prune Puree along with applesauce or alpple juice as a substitute also. Unfortunately, I loaned it to a friend and she’s out of town this weekend when I wanted to make some oatmeal cookies for my family. I love your web site and appreciate the many recepies you offer. So glad to have discovered your blog. My husband has recetly been advised by the Dr. to follow a fat free diet because of early signs of health problems, won’t do me any harm either! The recipes on here look so ‘do-able’ with easy to find ingredients. Thank you! !